Used to revalue GL accounts because of current rate changes. The user must have the setting Users/Currency/Revalue Currency to be able to run this function. The revaluation process can be run for ‘Today’s’ date or the user can select a past month(s) to run it retroactively. If there is a rate set for that month it will be used as a direct in the revaluation. If there is no rate set then it will use the main rate.See below. 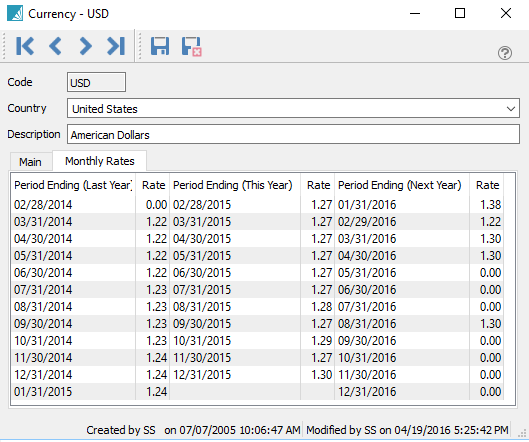 Before running the revaluation process be sure to set the rate for each currency. The revaluation will only be run on the GL accounts that have the ‘Revalue’ flag set on them. To run the revaluation go into the GL accounts view and highlight one of the GL accounts for the currency that needs to be revalued and click on ‘Revalue’. The revaluation will be run for all accounts with that currency. The user will be asked to select a date to revalue. Whatever date is selected the revaluation process will be done for that ‘Month End’ backwards and posted to the the date selected. The value in the base column for a foreign GL account is based on the exchange rate of each of the transactions that were posted to it. If the currency rate has changed, the revaluation function changes the balance of the account, for the month it is run to match the new rate. The difference gets posted to the GL account that was set for gain/loss for each currency. The foreign balance of the account does not change when reevaluating the account.